Steve Earle famously stated “Townes Van Zandt is the best songwriter in the world, and I’ll stand on Bob Dylan’s coffee table in my cowboy boots and say that.” Reportedly, Van Zandt responded “I’ve met Bob Dylan’s bodyguards, and if Steve Earle thinks he can stand on Bob Dylan’s coffee table, he’s sadly mistaken,” a line that perfectly embodies Van Zandt’s bone-dry sense of humor. He wasn’t lying, either. According to a biography by Robert Earl Hardy, Van Zandt rejected Dylan’s suggestion that they co-write songs. Van Zandt didn’t want to be Dylan; though he could be a shameless ham onstage (and in the 1976 documentary Heartworn Highways), he cared little for fame, money, or conventional notions of success. While Van Zandt never came close to attaining the stardom that seemed to be his birthright, it was partially out of design, partially out of apathy. For The Sake Of The Song, the title of Van Zandt’s first album, said it all. The songs were the only things that mattered, the ability to touch people on a profound emotional level, to create beauty out of nothingness and share it with the world, so other suffering souls out there might not feel so alone. Some artists chase stardom. Van Zandt ran away from it. He was endowed with an almost unseemly number of gifts: He was strikingly handsome, funny, charming, a natural storyteller and purveyor of tall tales, and a brilliant singer-songwriter with a weathered, world-weary voice that radiated loneliness and despair. Like so many of his outlaw brethren, Van Zandt was the worst possible guardian of his own astonishing talent. Born into wealth and privilege as the scion of a prominent Texas family, he spent much of his adult life living in a shack in the middle of nowhere, drinking himself to death. Songwriting came easy to Van Zandt, as did alcoholism, manic-depression, and drug addiction. In the clip, Van Zandt claims that “Waitin’ Around To Die” was the first song he ever wrote, though given his penchant for tall tales and self-mythologizing, it’s hard to believe him. Writing great songs may have come as naturally as breathing to Van Zandt, but beginning a songwriting career with “Waitin’ Around To Die” is like hitting a game-winning grand slam to win the World Series the first time you pick up a bat. In “Waitin’ Around To Die,” living is suffering, with death as the only possible escape. It was a new kind of country that tapped into the spare poetry of folk and the revisionist Westerns of Sam Peckinpah. Given Van Zandt’s affinity with the singer-songwriter-with-guitar tradition of folk and blues, it’s deeply unfortunate that on Van Zandt’s 1968 debut, For The Sake Of The Song, legendary producer “Cowboy” Jack Clement felt the need to dress up Van Zandt’s songs like a $2 Parisian whore. A song like “Waitin’ Around To Die” is bold and cinematic enough without Clement’s cheap, tacky over-instrumentation and overproduction. The country establishment didn’t know what to do with Van Zandt, who never released an album on a major label, so they gave him the cookie-cutter assembly-line treatment that has drowned the singular gifts of countless iconoclasts in syrupy goo. Van Zandt implicitly acknowledged that overproduction marred his debut by re-recording some of its songs on 1969’s Townes Van Zandt and other albums. Along with his other 1969 release, Our Mother The Mountain, the self-titled album found Van Zandt discovering his voice as a recording artist and a performer. “Be Here To Love Me,” the woozily psychedelic opener to Our Mother The Mountain, has a scruffy intimacy and vulnerability it shares with many of Van Zandt’s love songs. In songs and in life, Van Zandt couldn’t be pinned down. The joy in “Be Here To Love Me” is tempered by the knowledge that happiness and moments of deep connection are ephemeral, while sadness, loneliness, and torment are permanent visitors. For Van Zandt, that melancholy was biological as well as dispositional. After trying unsuccessfully to join the army during a period in his young life when he tried to do exactly what his family and society wanted him to do, Van Zandt was diagnosed as manic-depressive and given insulin shock treatment. Like many manic-depressives, he self-medicated with whiskey, heroin, cocaine, vodka, and anything else he could get his hands on. His life represented an endless battle between a talent too big to be denied and an impulse toward self-destruction that could never be satisfied. Van Zandt became as infamous for his personal problems as his creative triumphs. That aching, infinite sadness informs a string of masterpieces from the most fruitful period of Van Zandt’s career. 1971’s Delta Momma Blues serves, intentionally or otherwise, as an antidote to the kitschy overkill of For The Sake Of The Song: It’s an album of largely acoustic, bluesy numbers that puts the emphasis where it belongs, on Van Zandt’s voice and his songs. Most artists, even great artists, are lucky to create over the course of an entire career what Van Zandt created in a single year when he released High, Low And In Between and The Late Great Townes Van Zandt in 1972. He’s best known for his sad songs, but 1972’s High, Low And In Between begins on a note of rapturous joy with “Two Hands,” a gospel-inflected blast of pure sonic joy. Though he rejected comparisons, Van Zandt owes a debt to Dylan that’s felt keenly in songs like “Greensboro Woman,” a more tender, less vitriolic variation on “It Ain’t Me Babe,” where Van Zandt ever so gently lets down a potential conquest who’s offering short-term solace, in favor of the more substantive love waiting for him at home. The minimal instrumentation respects the fundamental delicacy of the emotions at play, while Van Zandt’s vocal is as hushed and holy as a whisper in a lover’s ear. The impish story-song “No Deal” offers a comic spin on Van Zandt’s bleak worldview and a keen illustration of his sometimes wry, sometimes goofy sense of humor. It’s striking how a listener’s moods affect the ways they perceive music. I spent hours recently listening to Van Zandt in the midst of a terrible day, and found his songs beautiful and poignant, but also agonizingly, almost unbearably sad. I listened to the same songs while in a better mood, and found his music still melancholy at its core, but also full of hope, gentleness, humor, and even joy. Van Zandt chronicled the geography of sadness with a deftness and intimacy few have matched, but he also explored the full spectrum of human emotion; there can be no sadness without happiness, and vice versa. “To Live Is To Fly” embodies that broad emotional spectrum; it cycles through world-weariness (“Living’s mostly wasting time / And I waste my share of mine”), Van Zandt’s deep connection to nature and the elements (“We got the sky to talk about and the world to lie upon”), and ultimately transcendence, in the promise of both the open road and the warmth and security of returning home. 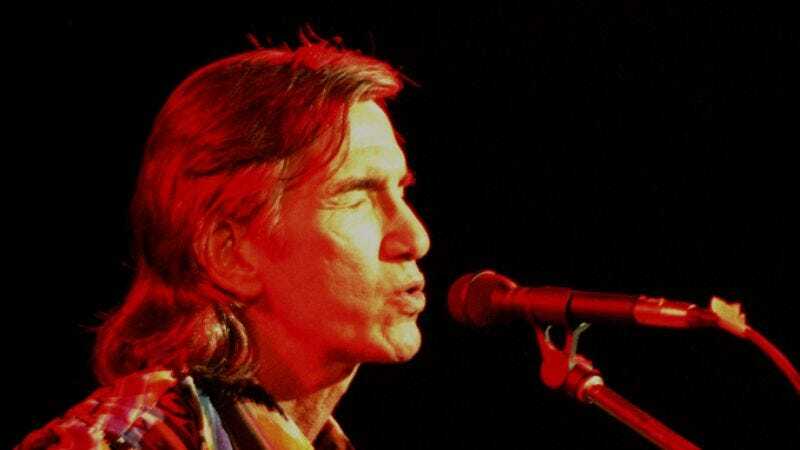 The Late Great Townes Van Zandt traverses a similarly broad range of moods and styles, from the rambunctious cheer of Guy Clark’s “Don’t Let The Sunshine Fool Ya” to what Van Zandt refers to in Heartworn Highways as his “semi-hit,” “Pancho & Lefty,” a tragic Western in song form about a desperado betrayed by a friend, and the turncoat who lives long enough to become a sad shell of a man. Everyone from Emmylou Harris to Van Zandt’s friend and protégé Steve Earle —whose latest album is a Van Zandt tribute album called Townes—covered “Pancho & Lefty,” but it found its greatest commercial success when Willie Nelson and Merle Haggard scored a huge hit with it in 1983. After his 1969 to 1972 peak, Van Zandt faded further and further from the limelight. He didn’t release another studio album until 1978’s excellent Flyin’ Shoes. A nearly 10-year gap ensued between that album and 1987’s At My Window. His final studio album was 1994’s No Deeper Blue. A long string of posthumous live albums has followed, but there’s supposedly still a treasure-trove of unreleased Van Zandt live and studio recordings, including an album of duets with high-profile admirers that could easily have been the biggest hit of his career, their release has been held up by infighting between Van Zandt’s ex-wife/executor and his longtime manager. Not even death, it seems, can keep Van Zandt from causing trouble. Or from failing to realize his commercial potential. “Pancho & Lefty” captures the essence of Van Zandt’s life, career, and fatalistic worldview: Whether you die an outlaw or sell out and live to see another day, you can’t win. But sometimes, there’s a sad majesty in losing.